"I remember the forest... before the winter, before the witch-girl, before the deaths, and now... the ice, wind, cold. The hunger. One brings the other, so sit and eat my friends! Outside the ice and wind will flay you and wear your skin. In here you can fill your hungry bones - I am the best hunter here and my hearth is never bare!" Vonn Gutturke lived in Neraive's village for years. Then as she became a woman, she changed. With the snows, her hair turned white, her skin grey, the cold shone from blue eyes and as she sang, icy winds keened with her. Spring was long returning and her powers grew so none could control her in the dark months. With that realisation came fear. Elders and wives muttered and she became their scapegoat. One year some bullies beat her with birch rods, then she screamed and the wind threshed them like corn. After that, they left her alone. Vonn didn't care, he had mouths to feed. Desperate beasts ran through the woods, seeking food depleted by ever-lengthening winters. Vonn and the other hunters fought wolves, bears and even each other. When Neraive vanished, it was one less. Yet the winter would not relent and shapes were seen in the trees, one even looked like her. The bullies took to the woods with sword and spear. They were seen among the trees that spring, icicles forming spiked armour around their joints and hoar-frost crusted on their grey skins. Vonn got lost chasing a deer. The wolves found him with it and his axe killed four yet they tore open his flesh. As he lay dying, her voice called his name to him and her hands cooled burning wounds. Snow and ice patched torn skin and sinew as damned hunger pressed into his wounds and he rose up, dead yet moving, his axe ready. Then he saw her, a perfect figure of ice and knew no ordinary axe would bite. Helpless and ashamed he fled her laughter and his hunger - greater than any mortal man can bear - into the winter woods, seeking his prey. Now he dwells in a lodge apart from the village, amidst woodsmoke, cured meats and hunting trophies. On the hunt he is dead silent. 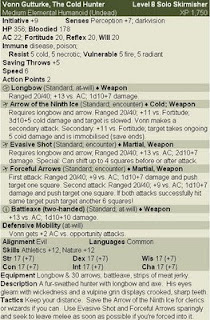 His arrows and axe bring needed food, while people go missing in the deep woods, the village is thankful for Vonn's skill. He visits the village to trade jerky, bonemeal, meat and furs for axes, pots and spices, he is boastful but well-received for his much-needed supplies. If he finds lost travellers he will offer them a meal but lone travellers learn too late that this is their final meal. Their bodies become a feast, then jerky and bonemeal. Vonn seeks to maintain his hunter's lifestyle. As undead he must feast on human flesh to retain his corporeality. He keeps his limbs hidden for the white ice that patches his flesh traces strange glyphs on his skin. His face is often touched with hoar-frost yet the gleam in his eyes and vulpine smile with sharp, crooked teeth belie the cold shadows of the forest. He dislikes fires, keeping his hearth burning low and steady and constantly cooking or boiling something that can smother the hearth quickly so it can't be used against him. Sometimes the figures in the trees pass close by his lodge but they do not bother him - his heart is as cold as theirs and his punishment already meted out. Now he need only feed himself yet his life is lonely so he feeds the others out of habit and to keep them from suspecting him. Yet his boasts will surely condemn him as young hunters seek him out to learn his craft for is he not the best hunter they know? He cannot eat them all and should one survive, the village will have no choice but to hunt the hunter. And so it goes. I linked this page from our NMP site and the NMP Facebook page. Thanks very much! Happy to take part! !